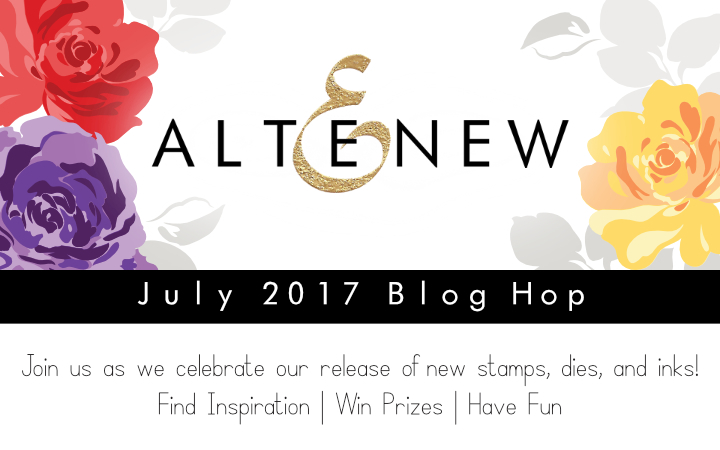 Are you excited about Altenew July Release 2017? Today's blog hop is sooo beautiful and you have probably came to me from the blog of our guest designer talented Galina Filippenko! For my first card I used Leafy Wreath stand alone die. Such a wreath die is a must for every cardmaker and crafter as you can use for every occasion, including Christmas. I also used new Script words die for a sentiment. For my second card I used Parrot Paradise stamp set that you will definitely love! My lovely monstera leaves - I loove this trend so much! I used Altnew's white embossing powder along with the parchment (kraft) cardstock. And for the third card I finally used one more love - succulents from the Indoor garden stamp set. I also used newest Crisp Dye inks and I like these bright colors. 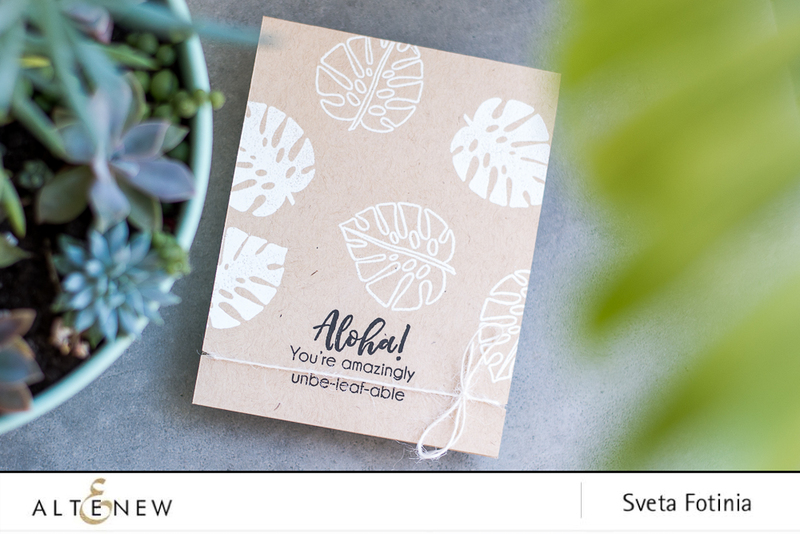 Hope you liked my card today and now it's time to check out what super talented Yana Smakula did for the blog hop! 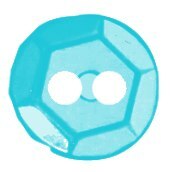 To celebrate this release, Altenew is giving away a $50 gift certificate to FIVE lucky winners! 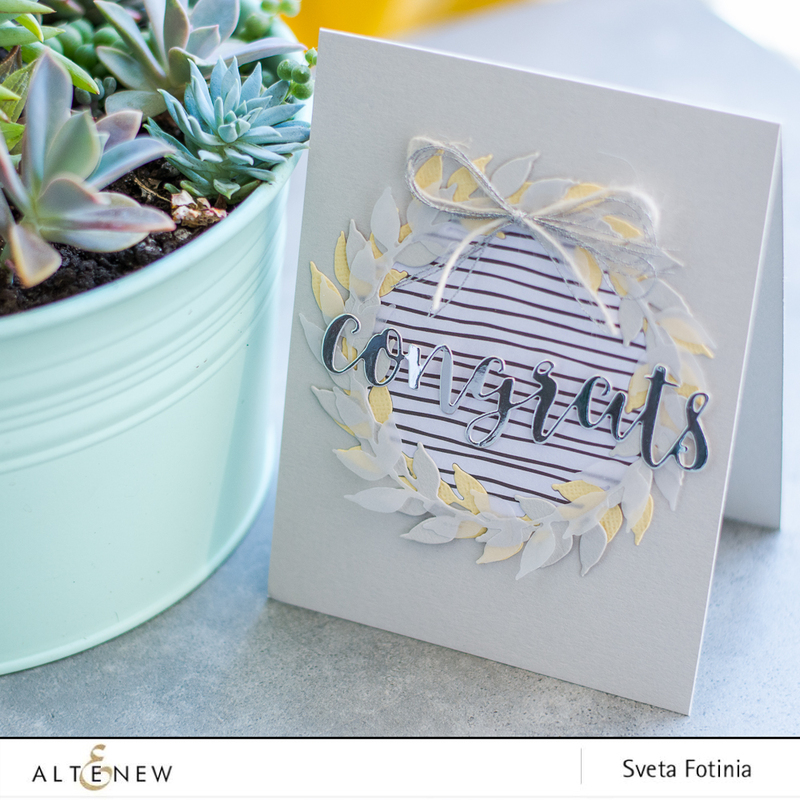 Please leave a comment on the Altenew Card Blog or/and Scrapbook Blog by Thursday, July 27th at 11:59 pm EDT for a chance to win. The winners will be announced on the Altenew Card/Scrapbook blogs on Sunday, July 30th. Beautiful cards! Really love the leafy wreath with the congrats, what a great design! All your cards are very pretty!! These are so fun and sweet! Love tropical leaf card. Thanks. I love the open wreath card with the stripes behind it. Thank you for sharing your amazing elegant cards. 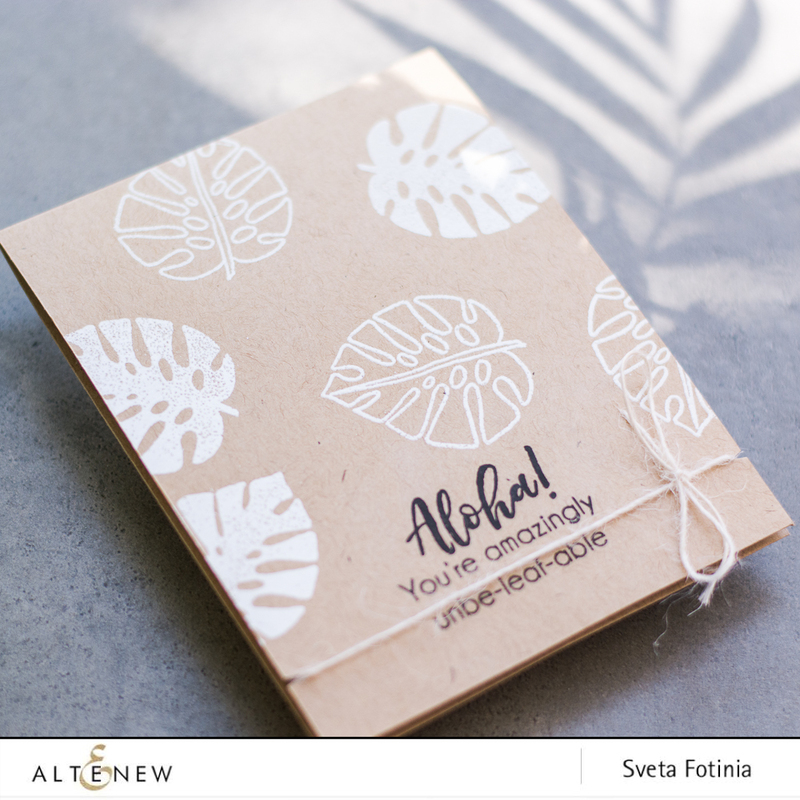 You have really made the new altenew release shine! Beautiful cards. That leaf wreath seems to have many possibilities! Very pretty cards. Great images. Love your coloring. Really beautiful cards - thanks so much for the inspiration! Wonderful cards - love them! Great variety of cards. Love the colors, both soft and vivid. Gorgeous cards - I can see that Leafy Wreath used in so many wonderful ways! This is a lovely release. 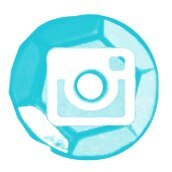 Love the images and new colors! Your succulent cart is very vibrant! Such pretty cards. Love the classy look of the first one... very elegant. The Kraft background looks great with the white palm trees... the indoor garden card is so pretty with the vibrant colors. Love the clean and simple look to your beautiful cards!Plus the new release. Love the colors on the Indoor Garden. Your cards are so beautiful! So many beautiful stamp sets! My wish list is growing with the Blooming Bouquet a must have. Beautiful cards and I totally agree that everyone needs a good wreath die! Your leafy wreath card is so elegant and beautiful. Such fun cards! I love the stripes behind the double wreath. And, the bright colored succulents are adorable. Thanks! Such fun cards love the layered wreath. Your Inside Garden card is my favorite. Very happy colors sure to make the receiver of your card smile. Thank you for sharing. Three great cards. I love the wreath on that first one!!! All three of your cards look great! I love how elegant the first card looks! It is stunning! These are great cards, Sveta. The first two are so elegant in their understated colors. I'm enjoying the way to used the three colors in the new release for the images and carried these over onto the sentiments. Great idea. Thanks for sharing all these cards. Wonderfully CAS cards, I especially love that first one! Beautiful cards! Love the Leafy wreath & think I need one for my stash!! Totally gorgeous collection of cards! Such beautiful cards! I love all the texture you have by layering up multiple types of wreath die cuts. It's truly lovely! Fabulous cards!!! So pretty!! Thanks for this inspiration!! Beautiful cards! Love the neat and beautiful look of the cards, especially the first one! So beautiful. Love what you created. Gorgeous clean cards! Thanks for sharing with us. 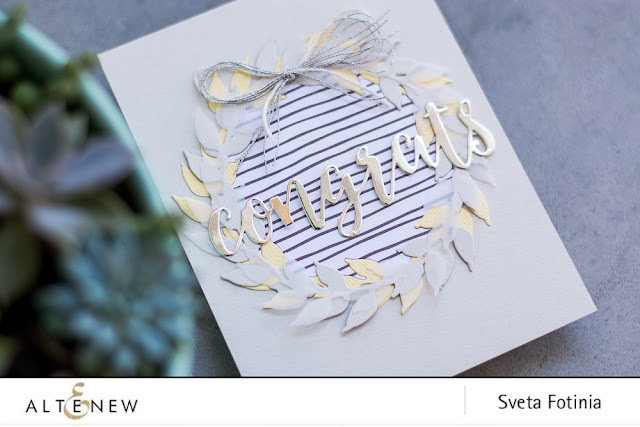 You are so right Sveta, the wreath die is a must have! Beautiful cards. These are all fantastic Sveta, esp. your first card. Its very elegant! These are all so pretty! I like the simple muted colors on the first 2 cards. Beautiful cards, just lovely!! Thanks for sharing . Лаконично и элегантно! А цветные суккуленты -просто прелесть! Beautiful cards. The wreath card is very elegant. I love the clean & simple designs of your cards. So very pretty! Thanks for sharing & for the chance to win. such sweet cards! Love your clean style. Love these clean and simple cards! Loving this release ... the balloons, the pansies, the arabesque design ... beautiful deisgns and projects by all you fantastic bloggers. Thank you for inspiring us all! Beautiful cards, love the elegant leaf wreath and the bright and fun Indoor Garden. The tropical white leaves on Kraft is so pretty too, love the CAS look. Love these cards. Beautiful images and coloring. Love the tropical looking card. Pretty. Great cards! Thanks for the inspiration. Love the white on the kraft. The wreath die is now on my wish list, I love how you used it for your card. Wreaths are classic. I do like how you stamped the sentiment three times in rainbow with the Indoor Garden, another set on my wish list. Well done today. Great CAS cards, so cheerful and bright! Wonderful projects! Love the diversity of what you made. Greta new release. Thanks for the inspiration! Beautiful cards! I love the Leafy Wreath die... one of my top picks of the release! Definitely on my wish list! Very pretty cards.The leafy wreath die is a must-have! Very nice. I love the wreath! Oh, my...the wreath is beautiful. It's so simple and yet it's stunning when layered that way! Thank you. Beautiful cards, the leaf card it my favorite! Simple yet oh so elegant! Your cards are lovely! Thanks for sharing! Marveling at your creativity and your stunning showcases of the new release. My CAS-loving heart is smiling, especially at the Indoor Garden arrangement! Thank you for the inspiration! AWESOME Hop and Release! 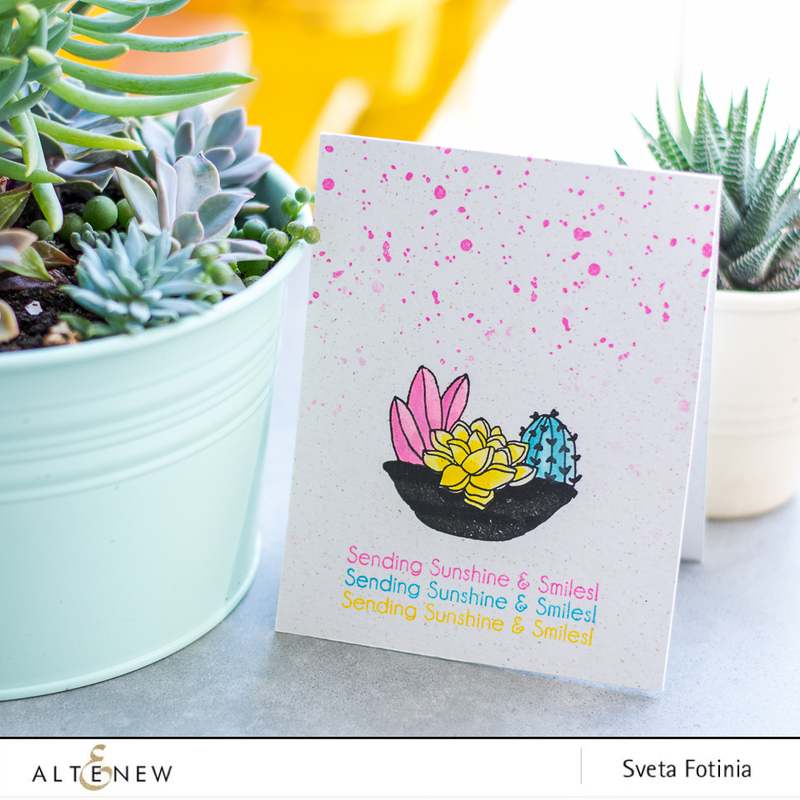 I especially love the pretty Sending Sunshine and Smiles card! Beautiful, your work is stunning! I just love that wreath die! Beautiful projects! These three creations are FABULOUS!! The wreath and leave cards are simply gorgeous.....love the style! My favorite is The Indoor Garden! I bought that stamp and the new inks right away and you just gave me a beautiful idea for how to use them. I might not have thought of those colors for it but they look so fun together! I love it! Thank You😊😍!! Hi Sveta, Love all your cards and I am in love with all new products, too. My favourite is your second card, love that funny sentiment. I love the new colors in the Altenew ink, especially my favorite color, yellow. When I win I want to get some of the new ink colors. Your cards are very creative and colorful. Everyone on this hop is so talented that they put me to shame. Thanks for showing us what you did and for giving us the chance to win something. I love everything! Very pretty designs, I really like the simplistic look. Love your designs! Love the new release, too!!!! Very nice cards. I especially love the one with the craft card base. Very beautiful cards--thanks for sharing with us! Love your designs, especially the one with parchment (kraft) cardstock! What lovely cards! This is another stunning release! Love those pansies and the heartfelt sentiments! These are gorgeous! I love them all! 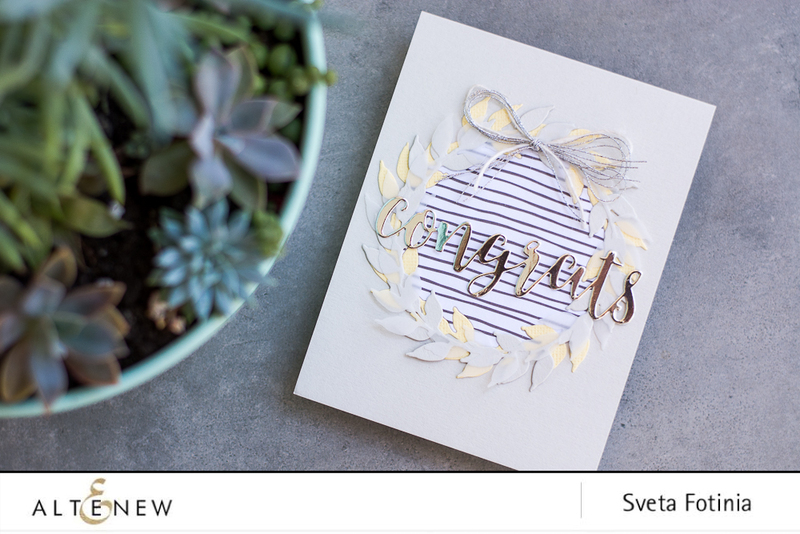 I love the simplicity of your Congrats card with the double layer of the leaf wreath - lovely. Thanks for sharing! These cards are really pretty with their subtle, soft colors! Delicate and feminine and beautiful! I really need to add the Leafy Wreath stand alone die must come live with me! I can see it being used as so many other things than a wreath too! I like your three toned wreath and also the way you showed the parrot stamp set can make a stand alone card using just the leaf stamp. Very imaginative! Wow! The wreath die wasn't even on my radar until I saw your beautiful card. Oh my ... my order list just keeps getting longer. Thanks for the gorgeous inspiration. three wonderful cards - especially love the wreath one! What a fun mix of card designs! Love the elegant wreath card! I'm loving the elegance of the white on kraft and with gold, but it's the unexpected indoor garden colors that just made me smile! 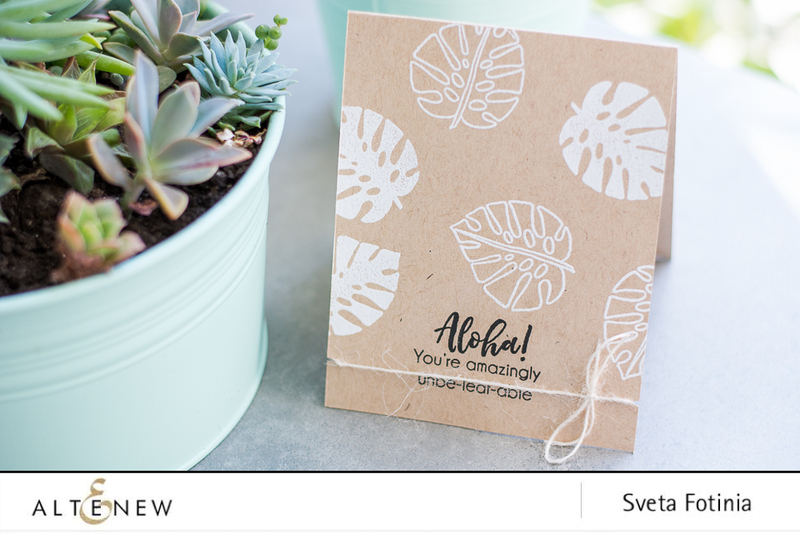 Clever color choices on the indoor succulents and ireally like the white stamping on the kraft cardstock. Thanks for the inspiration...lovely work. I love the leaf sentiments! Great cards. I'm loving the monstera leaf card. Wonderful cards, love your neutrals and bright colors. Действительно чисто и просто) а первая открытка - сама элегантность.. Loved everything. Thanks for sharing your ideas. 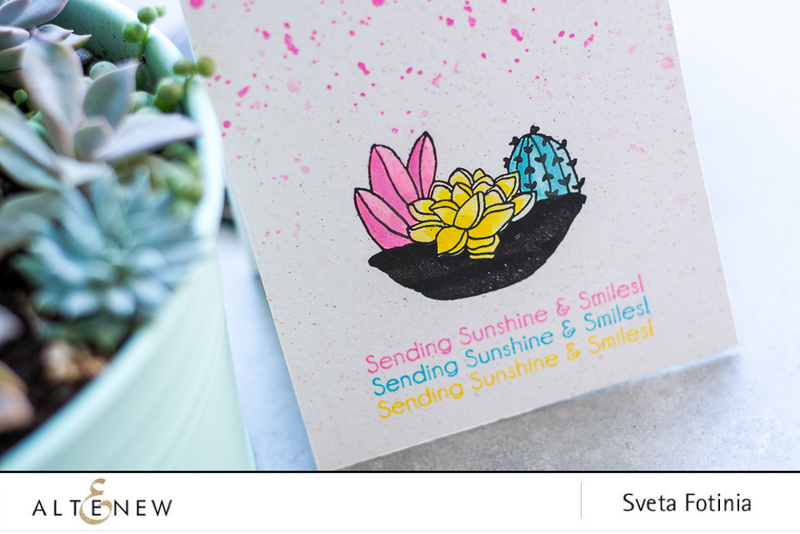 How perfect to show a bit of your succulent garden of real-life next to your card with the indoor garden - - a stamp set that I love! You have fun color choices - - like pink splatters on the indoor garden card. What a good idea, to stamp a small sentiment three times in different colors! I really liked the Aloha card. The embossing looked so nice on the kraft stock. All your cards are amazing Sveta! So much inspiration! Thanks for all you share! Love your elegant cards. They are so pretty! Your first two cards are so soft and pretty and your last card is simply fun! Beautiful cards! I especially like the first one. I'm especially INSPIRED by your GORGEOUS leafy wreath with glorious golden accents - WOW! Beautiful creations so hard to pick a favorite. Love the cards very simple and easy for us beginners. Thank you for sharing. Gorgeous cards, love the leafy wreath stamp. Thanks for sharing! Love your fun cards! Love the style of the first one most. THanks for sharing! Love all three cards. It's amazing at all the renditions that designers here are coming up with. All different but unique! TFS! Beautiful cards! Love the monochrome look! Brilliant idea to use a black stripe behind the wreath! I just love your indoor garden card, the more I see the new Altenew ink colours in use the more I fall in love with them! Thanks for sharing!! Lovely cards - you have such a variety of styles and they're all beautiful! Beautiful cards! The wreath card is elegant and the cactus so fun with the bright colors! Thanks for sharing your creativity! Glad you are with me!